Coffee beans from Intelligentsia and The Bean, or Cloud Gate, at Millennium Park. Then on to the Picasso exhibit at the Art Institute of Chicago. The exhibit was ridiculously inspiring. If you are in Chicago, get over there now, because it's only here until the 12th of May. Well, school break has come to an end, but on the final day, Maddie and I had some fun with one of her holiday gifts -- the hypotrochoid art set. I loved Spirograph as a kid (do they even make it anymore?) and have been on the look out for a set in decent shape at the yard sales, so when I saw this little set, I knew I had to get it for her. I have to say -- it's just as much fun now as when I was a kid and Maddie couldn't stop playing with the it either. Fun times. We started our homeschool year about a month ago, so we were ready to get out and enjoy the beautiful weather yesterday with a field trip up to Chicago and the Lincoln Park Zoo. Because we have limited funds and want to take a few more field trips this fall, we opted for this zoo over the Brookfield zoo because it is free, and while parking is pretty pricey, it is simple enough to park several blocks away if you are willing to walk -- especially on a weekday. Parking and walking had the added benefit of allowing us to walk to a lovely coffee shop on the way to the zoo -- Noble Tree Coffee & Tree -- and to take a leisurely stroll past North Pond and the Lily Pool -- both of which have been renovated since my days living in Chicago. I took no photos of animals, so I'll spare you that, but I will say that it is an absolutely lovely zoo -- even more so since they have done extensive renovations of the animal houses and landscaped the zoo beautifully over the past decade or so. Being able to take field trips like this is one of the reasons I love homeschooling! I love homeschooling my daughter. This photo sort of sums up the awesomeness of it all -- Maddie, sitting and drinking a latte (which she made), watching a geometry video on Khan Academy (great website! ), surrounded by origami models she has made. Maddie has been reading Holes by Louis Sachar to me in school and we have been loving it so much, that many days we end up eating lunch quite late because she asks to read "just one more" chapter 3 or 4 times. Then last night, she and I snuggled into bed and read for quite a while because we didn't want to wait until Monday to read more. I guess what I'm saying is -- if you have an kid around 8 or 9 (maybe up to 11 -- Amazon says 9-12 yrs), get this book! I think you'll both enjoy reading it together. Maddie has an etsy shop! Maddie decided that she wanted to start her own business, so I helped her set up an etsy shop -- Maddie's Weaving Workshop. She is *so* excited about this and she is keeping a journal documenting all the details. This is one fun part of homeschooling -- we are turning this into a school project and I think it will teach her a lot about working and finance as well as how to use Photoshop and other computer tools. And she is having so much fun. I remember when I was a kid and I had a big plan of some sort -- it's fun to see her grow up and get involved in a project. So, if you are in need of a potholder, please visit her etsy shop! I'm sure she will be ridiculously ecstatic when she makes her first sale. Pokemon and Legos -- a lesson in encouraging our children. Check it out at Homeschooling Maddie. Fall leaf identification post up at Homeschooling Maddie. I love making bread from scratch but it takes a lot of time and I hadn't done it in a while. For a couple years (yes, years) I've had it in my mind that I wanted to come up with a recipe for monkey bread -- you know, the cinnamon bread that you usually make by cutting up refridgerated biscuit dough and rolling it in cinnamon sugar and throwing it in a pan to bake as a loaf. Well, I wanted *real* bread -- not some nasty refridgerated biscuits. So Maddie and I pulled out 5 or 6 of my baking cookbooks and scoured them for suitable recipes. I finally settled on using the basic dinner roll dough from Essentials of Baking. This is a Williams-Sonoma cookbook and I've had great luck in the past with the recipes I've made from many of their cookbooks, so I was hopeful. Maddie read the instructions and I mixed things up. We left the dough to rise and Maddie checked on it after about 1 1/2 hours -- she was amazed! I think she is at a good age for an introduction to the magic of yeast! Then came the improvisation. I cut up the dough into about 30ish chunks and I dipped them in melted butter. Then Maddie rolled them in cinnamon sugar -- maybe 1 tsp cinnamon to 2-3 Tbsp of sugar? We had to refill the cinnamon sugar bowl a couple times during the process and thing got a little unscientific. The whole loaf took 1/4 cup of melted butter though -- we didn't run out of that. As Maddie coated them, she threw them into a bundt pan -- gotta love the classic bundt pan! And then we left it to rise while the oven pre-heated (about 20 minutes). Bake at 375 for about 35 minutes and once cool, turn out onto a pretty plate! It is quite yummy and would actually be suitable as a coffee cake. (I'm eating some as I drink my coffee right now!) It's sweet and buttery and I'll definitely make it again. I haven't been feeling all that well, so I haven't done a lot of crafting lately. I did start Maddie's second sock during some traveling to and from My Mother-in-law's this past weekend, but that's not very exciting, is it? 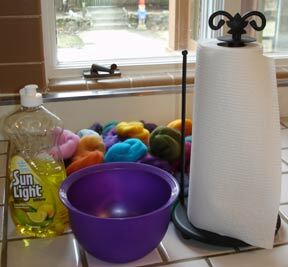 So if you want to see something interesting, pop on over to Homeschooling Maddie and check out Maddie's adventures with dyeing and weaving on a potholder loom. And if it's books that you are interested in, pop on over to Booga Talk to hear Pete and I talk about the books we are reading (me ~ The Wind-Up Bird Chronicle, Pete ~ Sister Carrie), have read and want to read. We also have a book give away in the works. Check it out! I finally posted over at Homeschooling Maddie. When I was at the Fold on Saturday, I saw the wall of merino fiber in every conceivable color and homeschooling crafts came to mind! I grabbed a bag and tried to get a bit of just about every color so that Maddie and I could try our hands at making some felted beads. Aren't the colors gorgeous all piled up together? Chose the color we wanted and broke off a bit about twice the size of the finished bead. 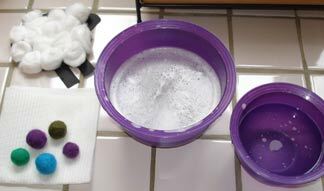 Rolled it into as smooth a ball as we could manage and then dunked it into the bowl of warm, soapy water. Fished it out and started gently rolling it between our palms to get it into a spherical shape. When it got too dry we dunked it back into the warm soapy water. When it got too soapy we dunked it into a bowl of warm, plain water. Repeat 3 & 4 until the bead is the size you want or until you are plum worn out! Here are the finished beads and the bowls of water. 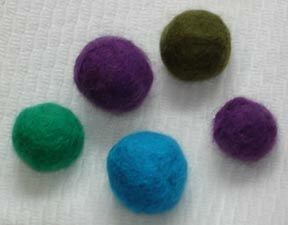 Not much output, but we also tried some beads with some BFL and they just didn't work out at all. And keep in mind -- you have to roll these for probably 5-10 minutes each (5 for me, 10 for Maddie who didn't use much pressure). Maddie thought it was a lot of fun though, so I'm sure we will be doing it again. Oh -- and see her sheep up in the left hand corner? MSL Kids had a section on sheep in the Winter Issue and this was one of the crafts. Cute, huh? So here is a close-up of our beads. 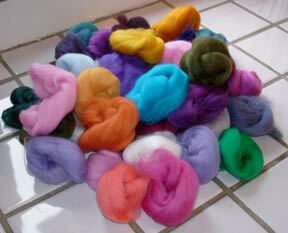 I'm thinking that I want to try some with other colors layered on top, or maybe I could embroider them after they dry. I seem to remember seeing something like that somewhere. Oh the possibilities!